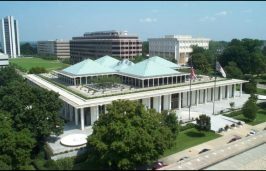 RALEIGH – With legislative deadlines for initial passage less than a month away, the push is on for environmental policy bills, including a tightening of emerging contaminant regulation. Rep. Pricey Harrison, D-Guilford, said she expected to win support for a first step in further regulation of per- and polyfluoroalkyl substances, or PFAS, with a bill banning their use in fire-retardant foams used for training. Harrison said she’s working on a universal ban on the use of the compounds in all firefighting foams, but she was still meeting resistance over whether there were adequate substitutes able to handle large industrial fires. The bill, which would ban the use of the substances in training facilities, also has the support of the Professional Fire Fighters and Paramedics Association of North Carolina. Harrison said she was hopeful that the bill would pass this year, but the pushback underlines how difficult it is for a state to regulate the rapidly growing PFAS universe, which includes compounds used in numerous industrial processes and household products. “It’s really hard to get a handle on how to contain this, but where we have known sources, we ought to be able to limit that,” she said. Last week, the House Environment Committee heard from representatives of the North Carolina Policy Collaboratory at UNC Chapel Hill and the new PFAS Testing Network, which the collaboratory set up to study the spread and effects of PFAS and related compounds statewide. This week, officials with the state Department of Environmental Quality were expected to testify on the department’s PFAS work and a request for additional help improving the department’s laboratories and testing equipment. Harrison said DEQ and the state Department of Health and Human Services had been stymied in their efforts to deal with PFAS by a lack of funding to handle the staffing requirements, laboratory space and necessary equipment upgrades. DEQ would get stronger enforcement powers in broader legislation filled in both the House and Senate. The legislation would require the state to follow the precautionary principal of full disclosure in discharge permits and prohibit the discharge of unauthorized and undisclosed compounds. The bill, parts of which Harrison filed last session in the House in the wake of the GenX revelations in Wilmington, would also repeal the so-called Hardison Amendment that prohibits the state from enacting laws that are more stringent than the federal government’s. Harrison said while the bill’s chances were slim, it’s important to continue the conversation. Harrison also said she wants it to be clear that the state has the funds and the authority to regulate PFAS compounds like GenX, which have no federal standards. She said that although DEQ officials have said they believe they have the authority to regulate the compounds, repealing the Hardison Amendment would remove all doubt. The bill would appropriate $6 million in recurring funds for 37 positions at the department and another $336,441 for a mobile drinking water testing lab to respond to hurricanes and algal blooms. In addition to Harrison’s bill, Sens. Kirk deViere, D-Cumberland, and Harper Peterson, D-New Hanover, who campaigned on the need for tighter PFAS protections for the Cape Fear watershed, have filed legislation to set up a PFAS task force to assist with research identifying the scope the problem in the watershed and the development of alternative drinking water supplies for affected areas. Legislation has also been moving in the Senate to address a recent court ruling that found certain state boards and commissions were unconstitutional because they fulfilled executive branch functions but did not give the governor an adequate number of appointments. Senate Bill 381, filed by Sen. Andy Wells, R-Catawba, would include more appointments for the governor to the boards of the Clean Water Management Trust Fund and Parks and Recreation Trust Fund. It would also eliminate the CWMTF Advisory Council and revise the criteria used in selecting projects. A competing bill filed in the House earlier in the session would add the new seats for the governor to the trust fund boards, but the measure does not include the criteria changes and it maintains the CWMTF advisory council. House Bill 545/Senate Bill 517 Offshore drilling ban — includes a policy statement in opposition to seismic airgun testing as well any offshore exploration for oil and gas in federal waters off the North Carolina coast. Also includes a ban of any exploration of offshore oil and gas in state waters and requires development of a state oil spill action plan. House Bill 572 and House Bill 567 Coal ash disposal — H572 would require that the remaining large coal ash compounds be excavated as part of remediation plans. H567 would prevent power companies from passing the cost of coal ash disposal on to ratepayers. House Bill 738 State Science Advisory Board — would write into law the composition and duties of the 11-member Science Advisory Board, which provides input and review on science, environmental impacts and health effects for DEQ and DHHS. House Bill 592 Check-Off Donation for Land Trusts — would create an option on state tax forms allowing taxpayers to donate a portion of their refunds to the state’s Conservation Grant Fund. House Bill 559/Senate Bill 496 Pollinator Protection Act — seeks to increase control over the use neonicotinoid insecticides to prevent damage to honeybees and other pollinators. House Bill 479 Solar Decommissioning Requirements — would study the effects and proper disposal methods and potential for recycling of large-scale solar facilities.